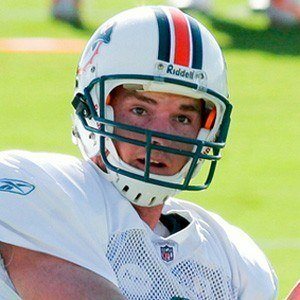 Quarterback who made his NFL debut in 2007 for the Miami Dolphins; two-time Academic All-Mountain West selection at BYU and 40th overall pick in the 2007 NFL Draft. He led Mountain View High School to a 25-2 record while he was a starter his junior and senior years and helped the school capture an Arizona State Championship his senior year. As a rookie he started five games for the Dolphins, though the team was winless in all five games. He married Barbara Ann Burke in 2004, and the couple had three children together. He was the fourth quarterback drafted in 2007, behind JaMarcus Russell, Brady Quinn, and Kevin Kolb.